In the summer of 1997, ERP stepped like a prancing mare from the stage of the Berkeley Store Gallery to the lush patio of Berkeley's Live Oak Studios. It was there that ERP recorded eight glorious tracks of digital lovin': the soundtrack to ERP's fourth hit rock opera, Earth Verses. With the addition of several remastered favorites, the round and shiny Pinnacle of Audio Technology was ready for mass production. An instant classic, the Earth Verses Original Cast Recording has thrilled young and old alike with its various haunting refrains and funk ruckuses. And now it comes to you, shrink-wrapped and perfect, for only sixteen dollars post-paid. You will want to keep your Emerald Rain Productions Compact Disc displayed prominently in your home or garden as a testament to your good taste. Perhaps you will even choose to put a nice velvet cordon around the viewing area. It's best that you order two, so that you have one to listen to. Or three! 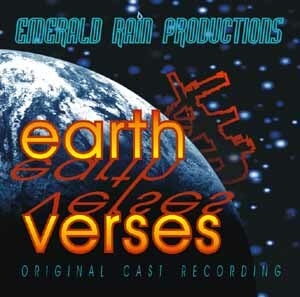 Experts agree that the Earth Verses Original Cast Recording makes a lovely gift. How can you pass up such a cheap and effortless conduit to pure listening satisfaction? You can't, that's how! See below for ordering info. Can't any more. We're sorry! We'll put all the songs online for you maybe probably why not. Featuring the whole EV soundtrack! 1. "See You Next Year"
6. "Packing List (What If?)" Plus new recordings of these ERPtastic megahits! Not to mention these three Vapor Tales crowd-pleasers, digitally remastered from the 1995 4-track sessions! 13. "Blue Funk" (Demo) by Dorothy's Not Home, featuring Neighbor, Alter, Doak-Anthony, Mann.